of Medicine, Cairo University, Cairo, Egypt. years of age will have diabetes . dicine and surgery services . lead to iatrogenic diabetic ketoacidosis (DKA) [7,11]. the hospital than SSI [7,13-15] . for DM is clearly needed. mic control in hospitalized patients with type 2 DM. times supplemental glulisine (apidra®) before each meal. not eating) according to Table 2.
was used for qualitative variables. Table 1. 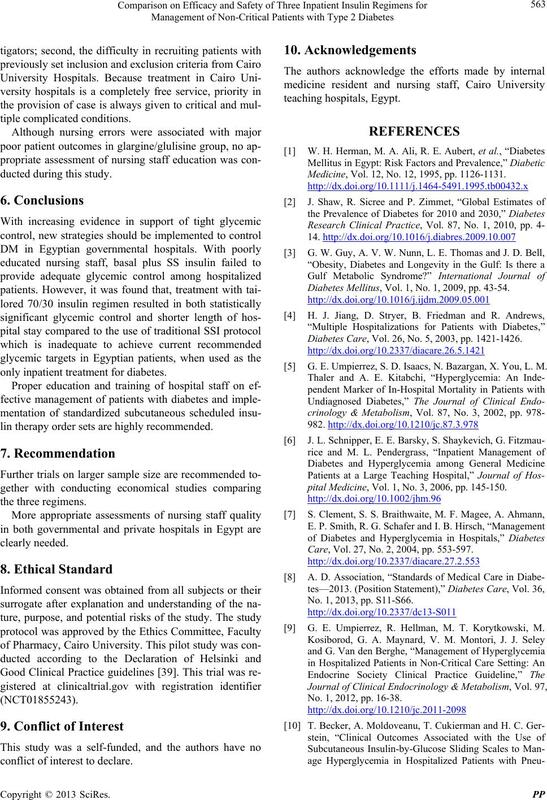 Modified Insulin Regimens applied to subjec t s treated with glargine/gluisine and Premixed 70/30 insulin. • Hold oral antidiabetic drugs on admission. • Glargine/glulisine treated patients should be started at half amount of the total outpatient insulin dose as glargine. • Premixed 70/30 insulin treated patients should be started at half amount of the total outpatient insulin dose as glargine. • Conversion unit glargine-per-unit 70/30 insulin. • In both cases: give glargine once daily in the evening around 8:00 pm. 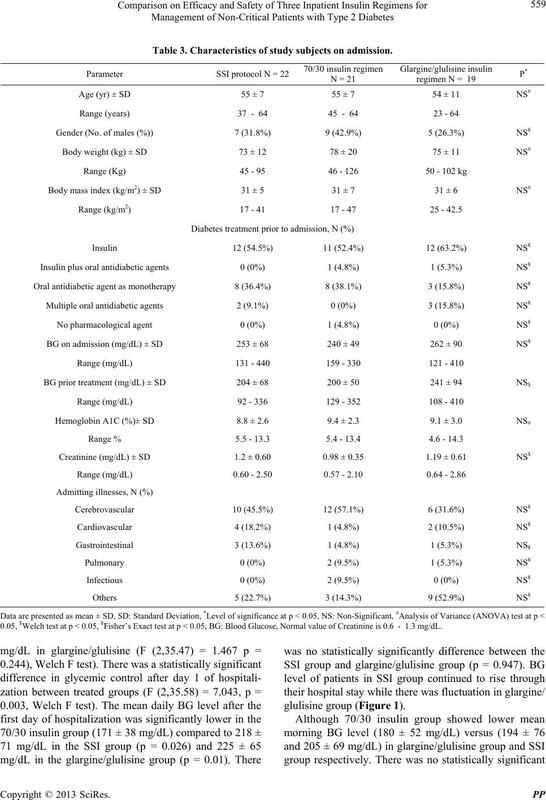 • Give glulisine three times before each meal for BG ≥ 150 mg/dL according to scale provided in Table 2. Hold glulisine if a patient is not able to eat to prevent hypoglycemia. • Premixed 70/30 insulin treated patients should be started at the same outpatient insulin dose and schedule. • In both cases: give two thirds of total daily dose (TDD) before breakfast and 1/3 of TDD before dinner. 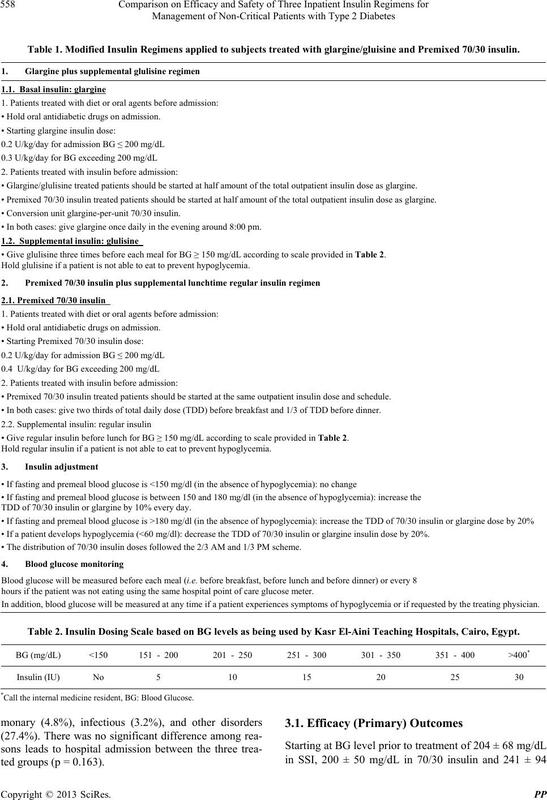 • Give regular insulin before lunch for BG ≥ 150 mg/dL according to scale provided in Table 2. Hold regular insulin if a patient is not able to eat to prevent hypoglycemia. TDD of 70/30 insulin or glargine by 10% every day. • If a patient develops hypoglycemia (<60 mg/dl): decrease the TDD of 70/30 insulin or glargine insulin dose by 20%. 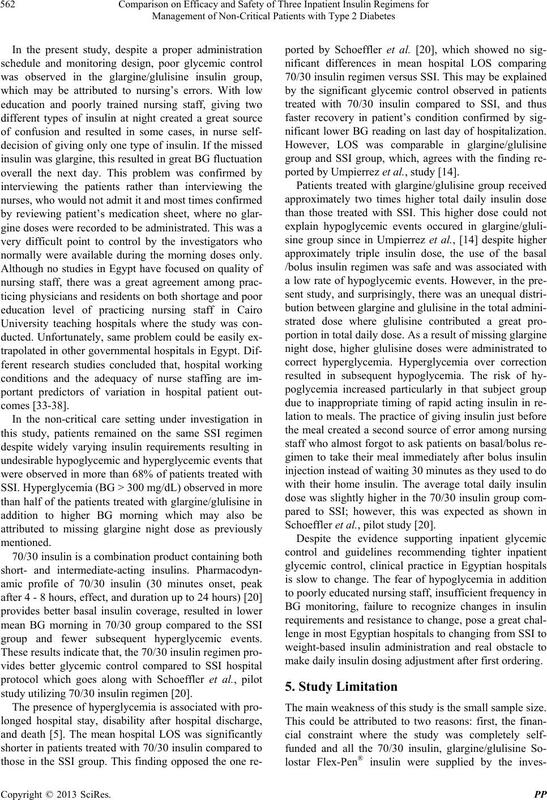 • The distribution of 70/30 insulin doses followed the 2/3 AM and 1/3 PM scheme. hours if the patient was not eating using the same hospital point of care glucose meter. In addition, blood glucose will be measured at any time if a patient experiences symptoms of hypoglycemia or if requested by the treating physician. Table 2. Insulin Dosing Scale based on BG levels as being used by Kasr El-Aini Teaching Hospitals, Cairo, Egypt. *Call the internal medicine resident, BG: Blood Glucose. ted groups (p = 0.163). Table 3. Characteristics of study subjects on admission. 0.05, $Welch test at p < 0.05, ¥Fisher’s Exact test at p < 0.05, BG: Blood Glucose, Normal value of Creatinine is 0.6 - 1.3 mg/dL. (Welch, * Significant, p = 0.003). groups (F (2, 59) = 0.772, p = 0.46). ± 67 mg/dL in the SSI group (p = 0.049). 220 ± 76 mg/dL in SSI group (p = 0.025). 8 ± 7 IU while daily glulisine missed doses 1 ± 2 IU. dose during their hospital stay. 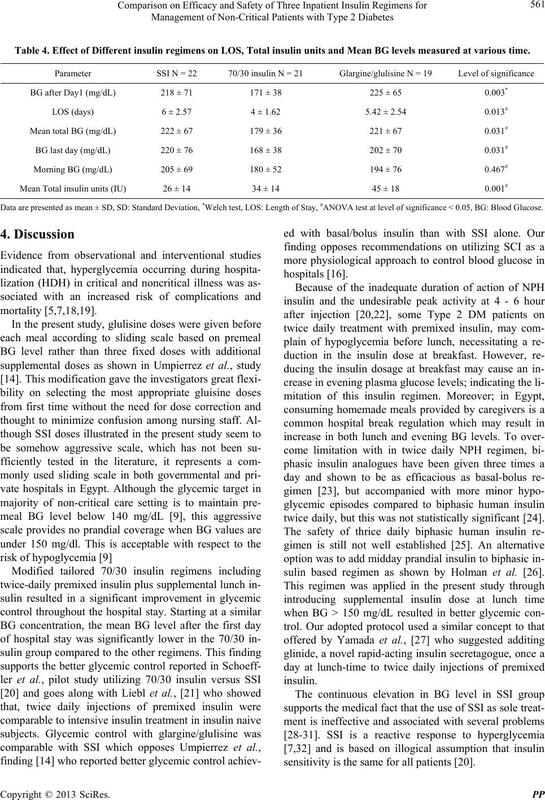 rienced major hypoglycemic episode of BG ≤ 40 mg/dL. mg/dL and were not associated with adverse outcomes. regimens and LOS (ANOVA, *Significant, p = 0.013). Table 4. 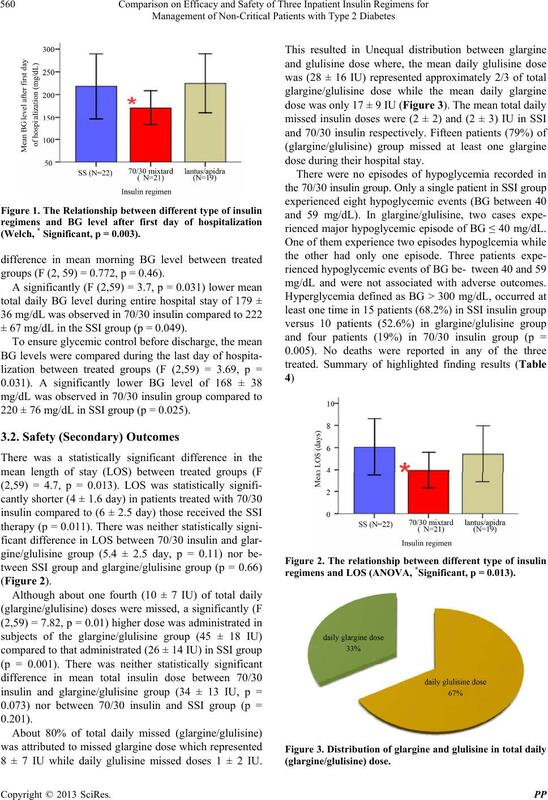 Effect of Different insulin regimens on LOS, Total insulin units and Mean BG levels measured at various time. Data are presented as mean ± SD, SD: Standard Deviation, *Welch test, LOS: Length of Stay, #ANOVA test at level of significance < 0.05, BG: Blood Glucose. twice daily, but this was not statistically significant . sulin based regimen as shown by Holman et al. .
sensitivity is the same for all patients . normally were available during the morning doses only. 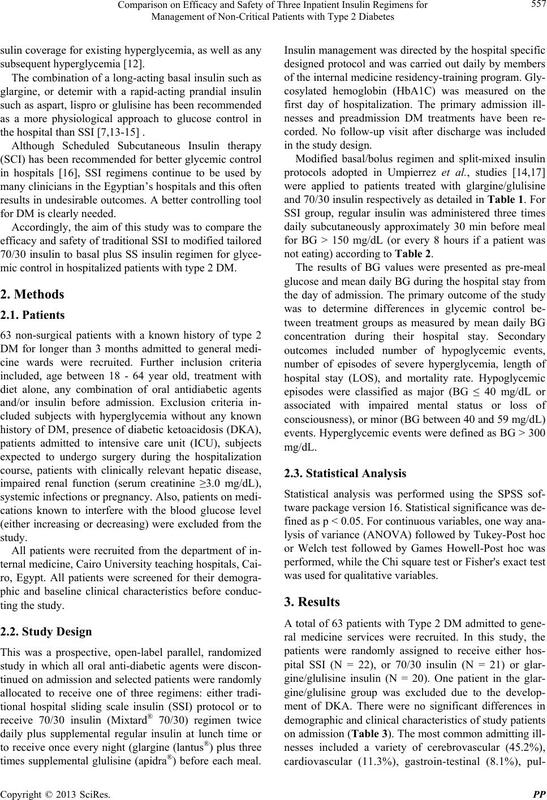 group and fewer subsequent hyperglycemic events. study utilizing 70/30 insulin regimen . nificant lower BG reading on last day of hospitalization. ported by Umpierrez et al., study . Schoeffler et al., pilot study . make daily insulin dosing adjustment after first ordering. The main weakness of this study is the small sample size. only inpatient treatment for diabetes. lin therapy order sets are highly recommended. conflict of interest to declare. Medicine, Vol. 12, No. 12, 1995, pp. 1126-1131. Diabetes Mellitus, Vol. 1, No. 1, 2009, pp. 43-54. Diabetes Care, Vol. 26, No. 5, 2003, pp. 1421-1426. G. E. Umpierrez, S. D. Isaacs, N. Bazargan, X. You, L. M.
pital Medicine, Vol. 1, No. 3, 2006, pp. 145-150. Care, Vol. 27, No. 2, 2004, pp. 553-597. No. 1, 2013, pp. S11-S66. G. E. Umpierrez, R. Hellman, M. T. Korytkowski, M.
No. 1, 2012, pp. 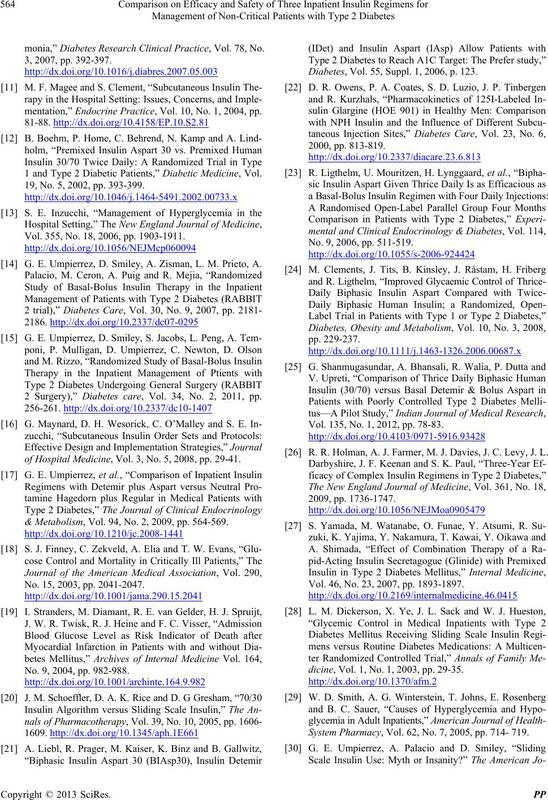 16-38.
monia,” Diabetes Research Clinical Practice, Vol. 78, No. mentation,” Endocrine Practice, Vol. 10, No. 1, 2004, pp. 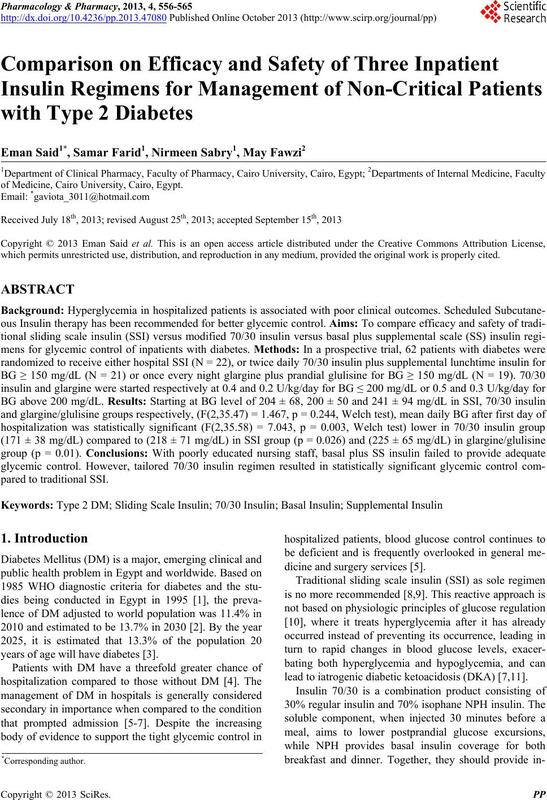 1 and Type 2 Diabetic Patients,” Diabetic Medicine, Vol. 19, No. 5, 2002, pp. 393-399. Vol. 355, No. 18, 2006, pp. 1903-1911. G. E. Umpierrez, D. Smiley, A. Zisman, L. M. Prieto, A. 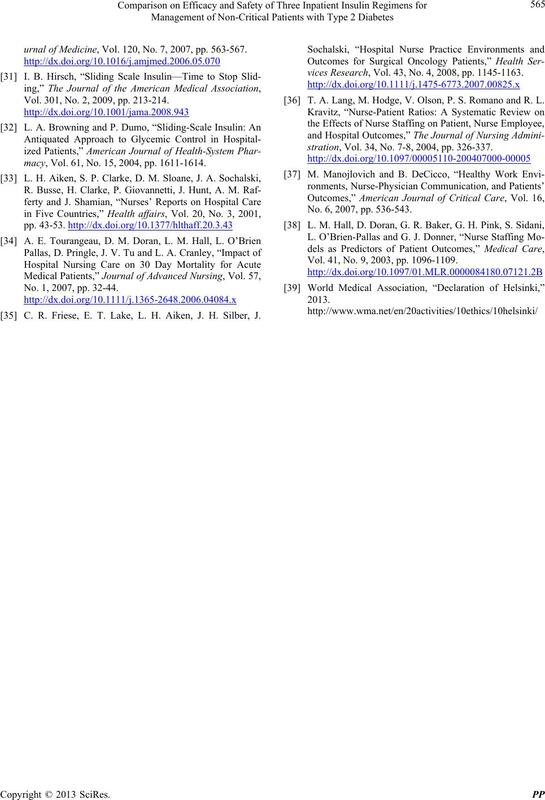 2 Surgery),” Diabetes care, Vol. 34, No. 2, 2011, pp. of Hospital Medicine, Vol. 3, No. 5, 2008, pp. 29-41. & Metabolism, Vol. 94, No. 2, 2009, pp. 564-569. No. 15, 2003, pp. 2041-2047. No. 9, 2004, pp. 982-988. Diabetes, Vol. 55, Suppl. 1, 2006, p. 123. No. 9, 2006, pp. 511-519. Vol. 135, No. 1, 2012, pp. 78-83. R. R. Holman, A. J. Farmer, M. J. Davies, J. C. Levy, J. L.
Vol. 46, No. 23, 2007, pp. 1893-1897.
dicine, Vol. 1, No. 1, 2003, pp. 29-35. System Pharmacy, Vol. 62, No. 7, 2005, pp. 714- 719.
urnal of Medicine, Vol. 120, No. 7, 2007, pp. 563-567. Vol. 301, No. 2, 2009, pp. 213-214.
macy, Vol. 61, No. 15, 2004, pp. 1611-1614. No. 1, 2007, pp. 32-44. C. R. Friese, E. T. Lake, L. H. Aiken, J. H. Silber, J.
vices Rese arch, Vol. 43, No. 4, 2008, pp. 1145-1163. T. A. Lang, M. Hodge, V. Olson, P. S. Romano and R. L.
stration, Vol. 34, No. 7-8, 2004, pp. 326-337. No. 6, 2007, pp. 536-543. Vol. 41, No. 9, 2003, pp. 1096-1109.